on September 5 & October 14, 2011. Cover photo by Dennis González. As children, Aakash Mittal and Stefan González were great friends, often visiting each others’ homes after attending school all day at Rosemont Elementary in the Oak Cliff section of Dallas. And then one day, Aakash and his family were gone, and the friends stayed out of touch for years until one day a message appeared in Dennis González' inbox, explaining what he’d been doing all those years. In the meantime, Aakash Mittal had been studying with Rudresh Mahanthappa, playing or recording music (including his own quartet debut) with Ravish Momin among others. 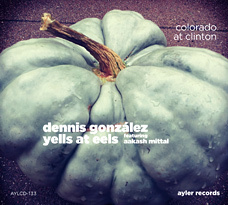 So it was decided that on Aakash's next visits to family in Dallas, he would join Yells At Eels (Dennis' trio with sons Stefan and Aaron) to record this CD. The recordings were intense and felt like they had known each other for years, which, of course, they had. But it really felt like they’d been playing together through the lost years. There would be much to say about the pieces that they played those two days, and of the stories that were told or created, but it’s probably better to let the music sound out its own story, for you to create your own film to this soundtrack of the four lives meeting on two beautiful autumn days.